Stern and at home at the podium. Midway through an especially fractious town meeting season, voters may reasonably wonder why anyone would want to preside over these raucous affairs. Everett Poole, who has served as Chilmark town moderator for more than four decades, has his reasons and will share them next Tuesday evening when he takes center stage at this month’s Tuesdays in the Newsroom event at the Gazette. 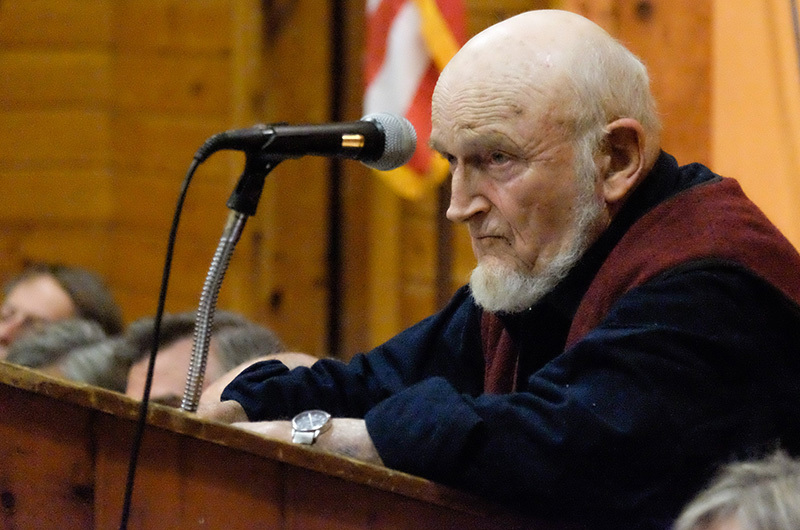 Mr. Poole was elected temporary moderator in Chilmark in September 1976 during a tense special town meeting and has been regularly re-elected to the post ever since. Straight talk, deep knowledge of town politics, common sense, a wry sense of humor and an innate sense of when to allow debate and when to cut it off are some of the reasons cited by others for his longevity in the job. Everett Poole and Tales from Town Meeting will begin at 5:30 p.m. on Tuesday, April 16. The event is free to subscribers of the Gazette; non-subscribers pay $10 at the door. Tuesdays in the Newsroom is a monthly speaker and discussion series held in the off-season for people who want more engagement with the news. Admission includes refreshments. Space is limited, so advance registration is required at newsroom.bpt.me.